The Welspun Group has a clear business culture: the challenges of the rapidly evolving global textile markets are best tackled by embracing new technologies and developing innovative products. Within two decades, this spirit of innovation has transformed Welspun India Ltd., into one of the largest global manufacturers of home textiles. Welspun's innovation partner in the field of rotor spinning is Saurer Schlafhorst, which has revolutionised rotor spinning with the Autocoro 8 and offers cutting edge technology to the textile companies with value added E³ label for energy, economics and ergonomics. At two mills in Gujarat with 24,000 employees, Welspun India Ltd produces 100,000 tons of yarn annually on 300,000 spindles. The yarn, made from cotton and cotton blends, is destined for the company's own weaving mills. Welspun produces coarser yarns on rotor spinning machines with 4,300 spinning positions. Of these, 2,400 incorporate the latest Autocoro 8 technology. The company covers the entire textile manufacturing chain up to making up and delivers to customers that are household names all over the world. Customer orientation and excellence are the noticeable features of Welspun. All the processes in the company are geared to the requirements of the customers. This exemplary service is reflected in the many awards that Welspun has received from its customers. IKEA recognised the company for the "Highest Direct Delivery Share", while Target presented Welspun with the "Partner Award of Excellence 2015". The Indian company was also given the "Best Supplier Award" by Sheridan. And George at ASDA presented Welspun with the "Best Product Quality Award for Egyptian Nanospun Towel". These are just a few examples from a long list of accolades. For Welspun, the enthusiasm of its customers spurs the company to become even more competitive through a forward-looking strategy. A company that wishes to stay ahead of the market in future must reinvent itself repeatedly. Welspun is facing this challenge with its visionary strategy for the future, "Welspun 2.0", which sends a striking key message on the programme: concealed in the word "Challenge" is the term "Change". Anyone aiming to overcome the challenges of the future must be prepared to change. The company has set itself ambitious targets. By 2020 Welspun aims to become one of the ten most valuable brands in India. Measured against its market capitalisation, the Welspun Group is also targeting Top 50 position in Indian industry. To achieve these goals, world's third largest home textile manufacturer is switching its production consistently to the latest technology. Innovation at all levels is the key to the future growth at Welspun. 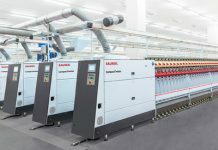 The partnership between Welspun and Saurer Schlafhorst has grown over decadesbased on common values. Innovation is in the DNA of both the companies which can be leveraged for mutual success through a partnership of sharing knowhow. Welspun, with its future strategy, opted for the most advanced rotor spinning technology from Saurer Schlafhorst. The Autocoro 8 is the most future ready rotor spinning technology in the market, with innovative individually driven spinning units. Schlafhorst has revolutionised rotor spinning five years ago with this legendary technology and have sold over one thousand Autocoro 8 machines to date. At Welspun, Autocoro 8 has brought down spinning costs by increased productivity and assisting the company in value creation. The Autocoro 8 has separated productivity from energy consumption and Welspun is able to set a new bench mark in higher speeds like 138,000 rpm even in coarser count ranges. At the same time, the energy requirement is significantly lower than for a conventional machine with belt drive technology. 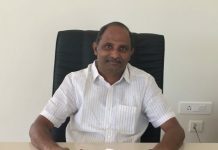 Sreenu Lingam, President at Welspun's Anjar facility comments: "In the highly competitive and demanding market, we are able to maintain our benchmark, quality and productivity in our most modern weaving and further with Autocoro 8 yarn." Sanjeev Jain, VP, Projects at Welspun added "Autocoro 8 with innovative drive system and flexibility, we could achieve new highs in productivity with minimum infrastructure." 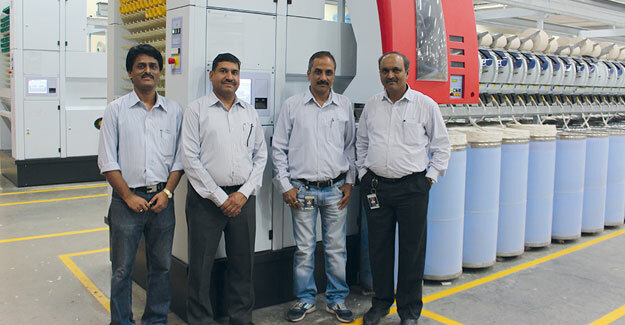 The Autocoro 8 has won Welspun not just with its unrestricted productivity and low spinning costs, however; the high yarn quality is another manifestation of its technological superiority. 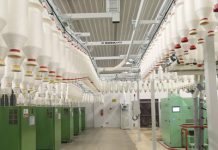 Among the advantages, optimised use of raw material without compromising yarn quality, operating with fewer yarn breaks in downstream processing are a few. It's an outcome of systematic efforts, supported by individual drive technology. "We are able to utilise the maximum fibre limits in terms of productivity without compromising quality" says Jaikishan Gupta, VP Spinning at Welspun Anjar unit. For a vertically integrated global scale textile company like Welspun, the end products reflect the crucial benchmark for quality and economy. Yarns being the core constituent of fabric must prove their performance in downstream processing. With the high-speed yarns made through Autocoro 8, manufacturers can fully exploit the performance parameters of modern weaving machines. At the same time, manufacturers can maintain the ambitious standards of quality, productivity and efficiency which are must for the demanding and competitive market.